My passion is the detective work in the analytical lab; I enjoy developing, running, and utilizing various methods to look for and quantify impurities. I find my work very challenging at times, but rewarding. In order to verify my findings, it’s good to have multiple techniques available to resolve any product issues. In my previous role as a Quality Control Chemist, it was my obligation to customers to provide the highest quality products. My exposure to chemistry started in my last year of high school. I worked in an environmental chemistry lab as a lab assistant cleaning glassware. I didn’t go straight to college after high school; instead, I went to work at the lab full time as lab assistant, and after that I worked as a field sample technician. In order to further my education and move ahead in the industry, I took some classes at Ocean County College, while working full time. After completing the required credits for an associate’s degree in chemistry, I had to decide what university to attend. I remembered Dr. Mack (Professor of Biology at Monmouth), who was an adjunct chemistry professor at OCC. Dr. Mack always spoke highly of Monmouth; as a result, I decided to enroll, and looking back it was the best decision! My experiences at Monmouth and my determination to do well were critical to my professional success. The first thing that comes to my mind was the welcoming atmosphere not only on campus, but in the School of Science. 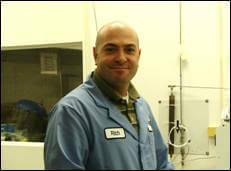 What intrigued me the most was the chemistry department staff’s willingness to assist me with any questions that I had. Dr. Kucharczyk, Dr. Lamberto, and other professors often went out of their way to go over any issues or questions that I brought to them. When grading they wrote constructive explanations/comments to incorrect answers on tests or lab assignments. The helpful comments provided better direction and more insight into the material. The smaller classroom sizes were absolutely beneficial to me. As an older student, I also knew the professors more on a personal level; the friendly atmosphere helped me to be more comfortable asking questions. I remember Drs. Supplee and Lamberto were professors who I would talk to about chemistry and life. Because I was working full time, the accessibility of the faculty was really important to my success. I found that the professors always seemed to make time to meet and discuss questions about the material. At Monmouth, I learned not only the theory behind, but the hands-on techniques for Gas Chromatography and Infrared Spectroscopy that have helped me succeed professionally. In my previous role, I used GC and FTIR extensively for high purity gas analysis. I received a useful, sound theoretical background, which helped me get ahead in method development. Monmouth challenged me to do better than I thought I could. I was offered a job during my last class at Monmouth. The years that I spent there were all positive; I really enjoyed the interactions with all the professors and other students. I am currently working for an analytical instrumentation company and looking toward furthering my education in analytical chemistry. No matter what your career path or passion in life may be, I would highly recommend starting it at Monmouth University. I am pleased and honored that I had the opportunity to be part of MU.